Be sure to read through all of the Bearville News when you log into Buildabearville.com. Most editions of the newspaper will award you with a free virtual gift when you read all the way to the last page! Yes that’s right there’s a new bear in Townsquare! 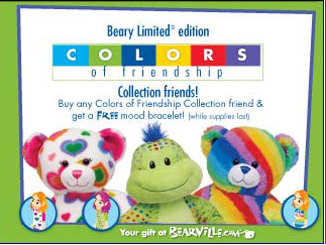 Stop by and meet (click on) the Colorful Peace Teddy. This rainbow colored Teddy is right next to Bearemy and is so happy to meet you! He’ll tell you to go meet two more bears 1) one in Pawlette’s Coufur Boutique and 2) the other at the Art Studio. Next, fly over to Pawlette’s in the Fashion District, meet the Colorful Hearts Teddy and start your very own collection of Colorful Friendship items. 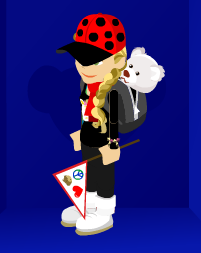 This week’s first item is a Rainbow Beret. Last but not least, go meet another new Colorful Peace Teddy at theentrance to the Art Studio! 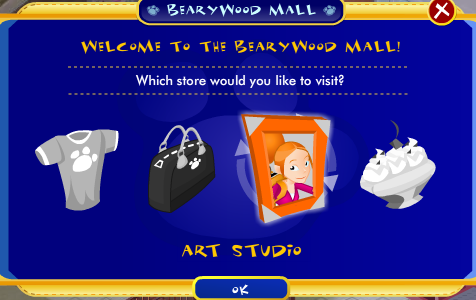 You won’t find the Art Studio on the map, it’s in the Bearywood Mall. Go to the mall, click on the Kiosk in the mall and select Art Studio. 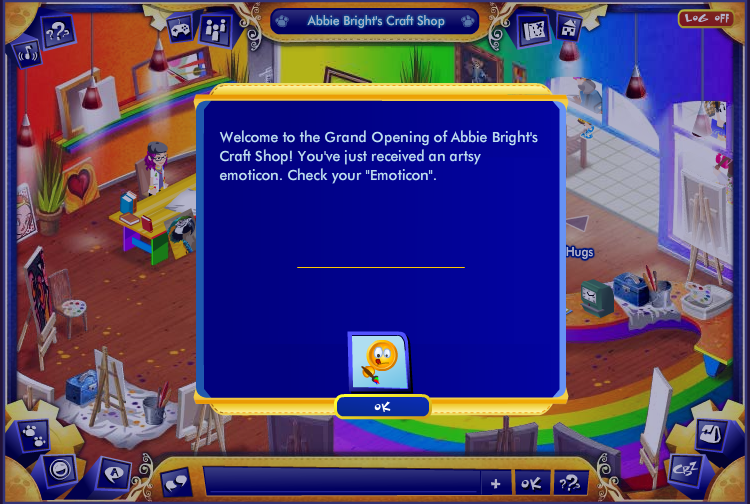 If you haven’t been here before, welcome to the Grand Opening of Abby Brights new Craft Studio! You will get a new emoticon just by entering. 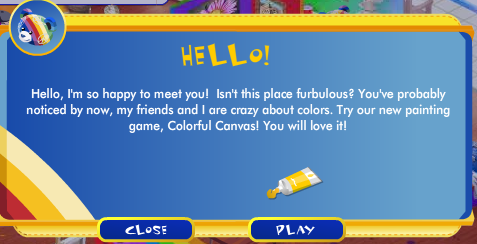 Check out the new Colorful Canvas game too, Have fun! Comments Off on A New Bear in Town! 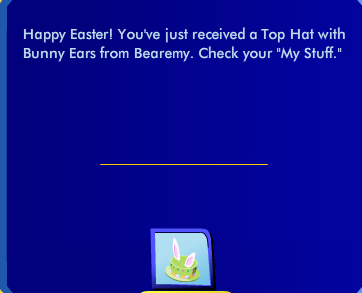 Be sure and visit Bearemy today to receive this special gift. Today is also the last day to enjoy the mysterious portal to ‘Easter Island’. Click on the statue in Town Square at Buildabearville.com and be transported to meet EB’s special friend (in the pink beret). Comments Off on Hoppy Easter! You can earn different badges by playing different games in Bearville! There are five categories: Visual Arts, Performing Arts, Fashion, Recreation, and Community. You will start at level 1 on each skill category and will be able to reach up to level 20. Visual Arts points are awarded for Photo Safari. Performing Arts points are awarded for Shake Your Honey, Bearrific Drummers, Words Fur the Birds, and Fast and Fabulous Shapes, Green Recycling Game. Community points for Canine Care, Pie Eating Contest and Diving Beary Deep. Neither points or bear bills for Stories & Activities, Pawsome Painting, DJ Furbulous, and Furshionista Dress Up. NOTE: Thanks to Pixarmc now we know that you have to get through at least one level to get the badge points. How to get the Badges – Play, Play, Play! Happy Valentine’s Day! Don’t forget to visit Bearemy in Town Square, today only, and get a free virtual heart t-shirt. Yes, they are just like the one’s from last year Valentine cards! Comments Off on Valentine Heart Tee! Starting today, Feb 11th, until the 24th be sure and check out the new Chloe show at the Bearville News Network! This time it’s Jake who interviews ChloeRocks! It’s the interviewer being interviewed! Who’s Jake? Direct from Hollywood – Disney’s Talk Radio Show! Check out the show and get your Buildabearview emoticon as a gift too! Jake talks about Radio Disney’s 15th birthday celebration and Chloe talks about upcoming changes to the Bearville home page, her new blog and other exciting news! Comments Off on Jake Interviews Chloe! Creepy, crawly insects! Read all about them in your Paws Fur Nature magazine! Click on your log table, either in your cub condo or in yours or someone else’s inventory, to open up the February edition of the magazine! Remembear: if you don’t have the table you can get one at the Libeary in Bear University. Just click on a magazine on the table! Answer the quiz on the last page and get your very own Lady Bug hat for a prize. Comments Off on New Paws Fur Nature!